Invest in a massage so that you can soothe away the stress and tense muscles. Hand & Stone serves people from across Fort Worth, TX, and we have a range of treatment options for you to choose from. We’re able to assist you with all types of challenges, including sore joints and muscles, scar tissue, and general tension. 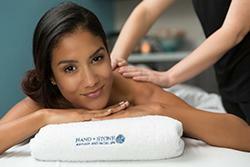 We also offer massage services for pregnant women, so call Hand & Stone today. With our team by your side, you can look and feel your best affordably. We’ve assisted people throughout Fort Worth and the surrounding areas, and we hope that you’ll be completely satisfied with your experience.